While trolling the internetz, I happened upon some really cute home decor ideas that could easily be copied for cheap (thank you Lowes, Hobby Lobby and Walmart). Our Walmart sells a similar style candle holder for five bucks and Hobby Lobby always has these bad boys in stock! Plus, it seems as though Hobby Lobby is always having a sale. You can find inexpensive boards at Lowes for around $4. You would probably want 4 pieces: one long piece for the front, bottom and back with the last piece cut into squares to make the compartments. An easy weekend project! You could even make a smaller version for the entry way and place things like flowers in each section! One more trip to Lowes for paint, wood and nails! Where are you finding inspiration? 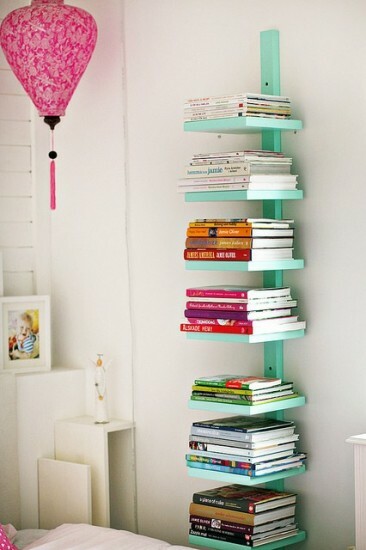 i loooove that turquoise book shelf! what a good idea! these are great girl! i can't wait to see your finished product. love all of these, love the color on the bookshelf! also i added your button (finally) to my blog! yeah! All such great ideas! Now if I could only convince my boyfriend that not ALL DIY projects have to be perfectly perfect, I would try all of them! I think I need one of those cubby things in my bathroom! Super fantastic ideas!